June is National Safety Month. Injuries are the leading cause of disability for people of all ages and the leading cause of death for Americans ages 1-44. Did you know that every 4 minutes someone dies in the US from an unintentional injury, that is 120,000 people every year. The top 3 causes of unintentional injury in the US are poisoning, motor vehicle crashes and falls. In 2012 motor vehicle crashes resulted in 36,300 deaths with 26% of all crashes were caused while using a cell phone. So many of these injuries and deaths can be prevented when people practice safe behavior. Here are things that you can personally do to protect yourself and others while on the road. KNOW THE RULES OF THE ROAD: Make sure you are fully aware of the driving rules of the place you are driving in. Especially if you are traveling to different states where the rules could change. About 30% of all road accidents occur because people don’t know and don’t follow the rules of the road. BE CAREFUL: Drivers need to be careful of what they are doing and others as well. There are many people on the road that shouldn’t be, and that means we need to be fully aware of everything and everyone on the road. BE MINDFUL OF OTHERS: While driving we can become distracted by many things; cell phone, children, eating that can cause us not to pay as much attention to the road. We need to be mindful of other drivers as well as individuals on bikes, joggers or people just walking on the side of the road. BE PATIENT: There is a lot or road rage going on these days because lets face it, everyone is in a hurry and no one has patience’s. Many people have lost their lives on the road due to impatient drivers. Stay calm and remember your destination will be there even if you are 10 minutes late. Out of 100% of accidents 20 of them occur because someone is not doing the right thing at the right time. INSPECT YOUR VEHICLE: Before you travel make sure your vehicle is in good and working order. 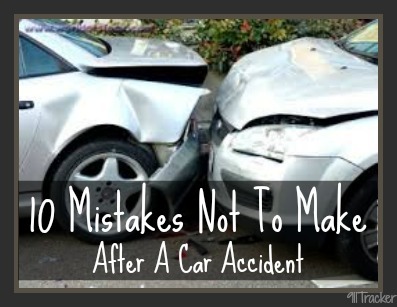 So many accidents occur because of a faulty car. Sometimes the simplest issue could cause a major accident. Spent that extra time beforehand to have your vehicle looked at by a certified mechanic before traveling long distances. On the 911Tracker Blog our goal is to keep families safe. We thought it would be helpful to give you a recap of our safety posts so you have useful information all in one place. To get the latest information on ways to keep your family save on and off the road subscribe to 911Tracker and also head over to the National Safety Council. This entry was posted in Car Tips, Safe Driving and tagged Car Accidents, Car Safety, Safe Cars on May 30, 2014 by Deanna. Throughout the month of April we have been giving tips on the risks of distracted driving and what you can do as a responsible driver to decrease your changes of getting in a accident because of being distracted. Did you know that 100 people everyday die in car crashes because of distracted driving? There are so many risks when driving distracted. Here are some facts. Distractions take a motorist’s attention off driving, which can make a driver miss critical events, objects, and cues or abandon control of a vehicle, all potentially leading to a crash. Distracted drivers put not only themselves at risk, but everyone else using the road. Put aside electronic distractions – Don’t use cell phones while driving – handheld or hands-free – except in absolute emergencies. Never use text messaging, email functions, video games or the internet with a wireless device. Eat Smart – If possible, eat meals or snacks before or after your trip, not while driving. On the road, avoid messy foods that can be difficult to manage. Enlist a Co-Pilot – When driving with others, enlist their help with directions, handling the kids or pets so you can focus on driving. Secure Children and Pets – Before hitting the road make sure children and pets are secure in car seats and have everything they need. By reaching into the backseat it could cause you to lose control of the vehicle and get into an accident. Make Car Adjustments Beforehand – Before leaving your driveway make sure your GPS, seats, mirrors, climate controls and sound systems are set before hitting the road. Although most distractions are avoidable, some distractions are impossible to completely prevent – instead they must be managed. Driving requires your full attention. Take charge by using these tips that will help you eliminate distractions so you can focus on the road ahead. This entry was posted in Car Tips, Safe Driving and tagged Car Accidents, Car Safety, Safe Cars on April 21, 2014 by Deanna. One of the biggest things that can ruin a perfect day is having an auto accident. Not only does it take time out of your day but you then need to deal with damage to your vehicle, possible injuries, and or insurance issues. Vehicles are being build better therefore U.S. traffic deaths fell by 4.2 percent during the first half of 2013, according to the National Highway Traffic Safety Administration, but more than 15,000 people died in all forms of motor vehicle crashes in just the first 6 months of 2013. We are here today to help you and others involved in a accident stay safe by teaching you the 5 things you should never do after a vehicle accident. When avoiding these simple mistakes you should be back on the road in no time. LEAVE THE SCENE – Even if you are in a minor accident, no one is injured and you are able to drive your vehicle, don’t leave. You always need to stop and exchange insurance information and report it to the local police. FORGET TO CALL 911 – You are in a simple accident, no one seems hurt and all vehicles are OK to drive, so you think – let’s just exchange insurance information and we will be good to go. WRONG! You have no idea if the other person involved in the accident is telling the truth, their insurance could be out of date, not real or they also could have active arrest warrants. It’s always best to be SAFE NOT SORRY – call 911. GET ANGRY – No one likes being in a car crash. Emotions can run high which can make it easy for people to loose their cool while dealing with the other person involved in the accident. If you are able to get out of your vehicle make sure you take some deep breaths and head over to the other car to make sure everyone is OK. Yelling and making a scene isn’t going to help you in the long run, and the other person involved could press charges against you for harassment. BLAME YOURSELF AT THE SCENE – Never tell the other person involved that its your fault (even if you clearly know it is). If you do this, you’re legally admitting liability for the accident which could cause a lawsuit or other penalties. FORGET DOCUMENTATION – Always have the proper and up to date insurance and registration documents in your vehicle. If not you will get some major fines which is something you don’t need considering you will need to come up with cash to pay for damages to your car. TAKE DOCUMENTATION DOWN – It’s hard to think clearly after an accident, even when it’s minor but it has to be done to help you later on. Write everything down from what you were doing before the accident, what street you were on and even take pictures of the scene. Remember to take down the other drivers name, address, license plate number, insurance information, policy number, and make and model of the car. You will need to give very detailed information to the local police. NO FOLLOW UP AFTERWARDS – After the accident, once everything has been filed and your vehicle has been fixed you may forget to follow up on some important details. If you were injured in the accident but not severely you may think “I can handle it” but if the pain is persistent contact your doctor right away. If you need to miss any sort of work because of the accident it might be time to call a lawyer so you can get help financially with medical bills. Also, register your insurance claim quickly because most insurance companies have a time frame of when you can file a claim. TALK TO THE OTHER’S INSURANCE COMPANY – Let your own insurance company contact the other person’s insurance company. They are more familiar with what questions to ask and they are working for you and will do the best they can do to make sure you are protected. TALK TO THE OTHER’S LAWYER – If the other person involved in the accident contacted a lawyer chances are you’ve done the same thing. Let the lawyers work things out, you don’t want to incriminate yourself by saying something you shouldn’t. Trust the professionals! DON’T SETTLE TOO QUICKLY – If the accident reaches a stage where insurance companies and attorneys are discussing settlement make sure you look at all your options and not settle too quickly. Consider all offers and remember to take in account expenses, damages and medical bills that happened because of the accident. Be safe on the road, and if you do happen to get yourself in a car accident remember these tips to insure your safety. Remember when the 911Tracker is installed in your vehicle you can easily contact 911 so the local police knows exactly where the accident has taken place without you verbally giving them that information. This entry was posted in Car Tips, Safe Driving and tagged Car Accidents, Car Safety on February 10, 2014 by Deanna.